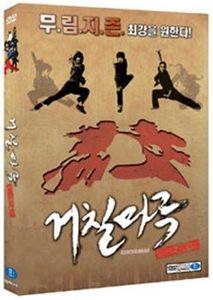 Geochilmaru (aka: The Showdown) is a movie about martial artists. The most interesting part of this movie is that it was filmed with real martial art experts, no actors, no stuntman, no wire and no CG. Musashi66, a big powerful kickboxer, Chulsajang, a beautiful lady but a deadly Wu-Shu fighter and Mohican, a flash and amazingly fast wu-shu master are especially charismatic on the screen. Mashimaro, a colleage heavy weight ssirum (Korean tradtional wrestling) champion and Beatbox, a bantam weight boxer, kickboxer and also hiphop dancer are very likable charactors. Most of "acting" was done by two actors, Salinmiso, a body guard, and Chunjanjigu, the only real actor who is not a master of martial art. A legendary boardmaster of internet bulletine board "Mulimzijon" has been respected by his deep knowledge of all kind of martial arts. But he has been continuously challenged by members of the board but never showed his face. Some of the martial artists suspect whether GEOCHILMARU is real, since no one ever met him in real life. One day, GEOCHILMARU granted the challenge and select 8 experts among member. The 8 young masters are summoned to a small village in Kangwon province. When they arrived, they got message from GEOCHILMARU that only one of them can face him. Now they should choose one champion who will face this mysterious GEOCHILMARU. One cannot help but feeling some sentiment toward the charactors in the film. These people are slightly out of time because they are in love with the martial arts. It is somewhat touching to think about that they play themselve in the movie.